When you think of baking, usually images of Victoria Sponges, fondant fancies and colourful Battenbergs spring to mind. However, my favourite challenges on The Great British Bake Off are always when they get to make something savoury. I just find it a bit more exciting. I think it takes a little more imagination to come up with a good savoury scone, pastry or vol-au-vent. 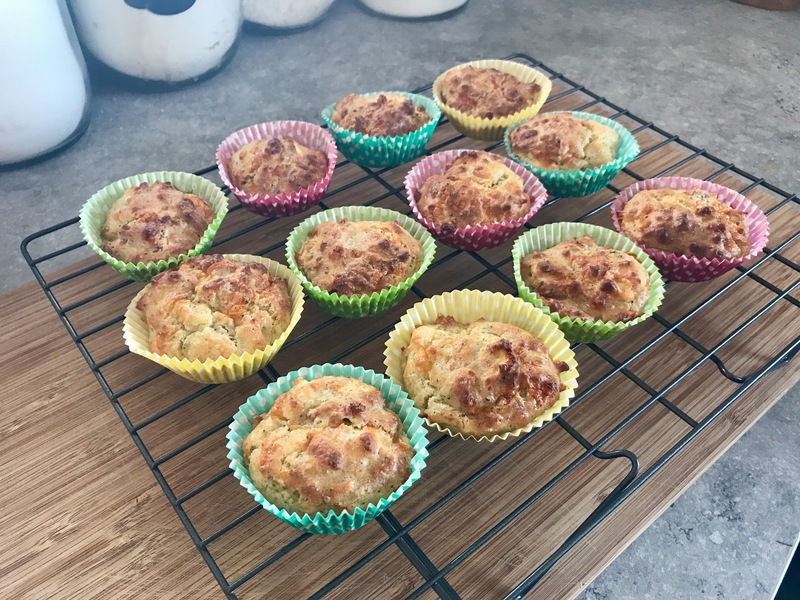 I’ve seen lots of videos doing the rounds on social media lately with recipes for savoury scones and savoury breakfast muffins and it was an idea that really appealed to me. As a busy person always on the go and always working in different places, the idea of taking a couple of breakfast scones to munch on for breakfast in the office really suits me. I don’t like having breakfast before I leave the house as it’s a bit too early for me and as a freelancer it’s not always practical for me to be making cereal or porridge in the office as I don’t always know what facilities there will be. Snacking on something I’ve already made seems like a great solution to me! I originally planned to use only cheddar for this recipe but I had some feta to use up so I threw that in too. You can easily swap the cheeses out for whatever you prefer or whatever you need to use up, just make sure you have the same overall quantity. Equally feel free to omit the bacon if you prefer a vegetarian breakfast. These don’t even have to be reserved for breakfast, have them for a snack, take them on a picnic or serve for lunch with a salad on the side. I took a batch into the office and they went down brilliantly as a mid morning snack for the team. 1. Preheat the oven to 190ºC. 2. In a large bowl mix together all the dry ingredients: the broccoli, cheeses, flour, bacon, baking powder & salt. 3. In a separate bowl whisk together the milk, butter and egg. 4. Pour the wet ingredients into the dry and fold together until everything is combined. 5. Line a muffin tin with cupcake cases and fill each one until just short of the top (they will rise in the oven).